The Holly Heights Polo and Hunt Club is reputed to have run 15 acres touching the corner of Fulton and Ventura Boulevard. There were two first class polo fields, a two story club house, swimming pool, and 200 stables. Exactly when this facility opened cannot be reliably confirmed at this time. In 1925 club management shifted. 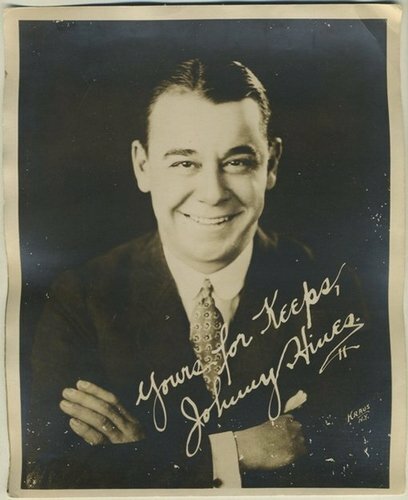 May 3, 1927 the Van Nuys Daily reported Johnny Hines, star of First National Picture Corporation, had a large cast on the location shooting a film. By May 25, 1928 the Van Nuys Daily reported the club was closed for months and vacant. At that time F.W. Ellingswood, with offices opposite the Hollywood Hills Country Club on Ventura Boulevard (a defunct country club beyond the scope of this post, located between Fairway Drive and at least the present site of Harvard Westlake in Studio City), and a brother in charge of the North Hollywood riding academy on Whitsettt (most likely the present day site of Studio City Golf and Tennis), planned to take the club over and restore it to its past grandeur. By 1939 the club no longer touched Ventura Boulevard. 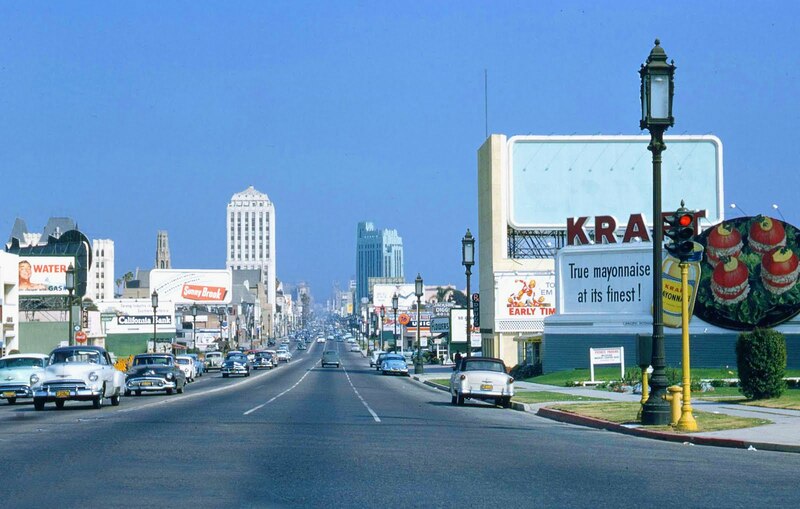 Rudy’s Dine, Dance, Swim, and Ride went from Dixie Canyon to Fulton North of the present alley in back of Ventura Boulevard to South of the Los Angeles River. These are the present sites of Dixie Canyon Elementary and Saint Francis de Sales both of which can be seen from the window of my Sherman Oaks office. 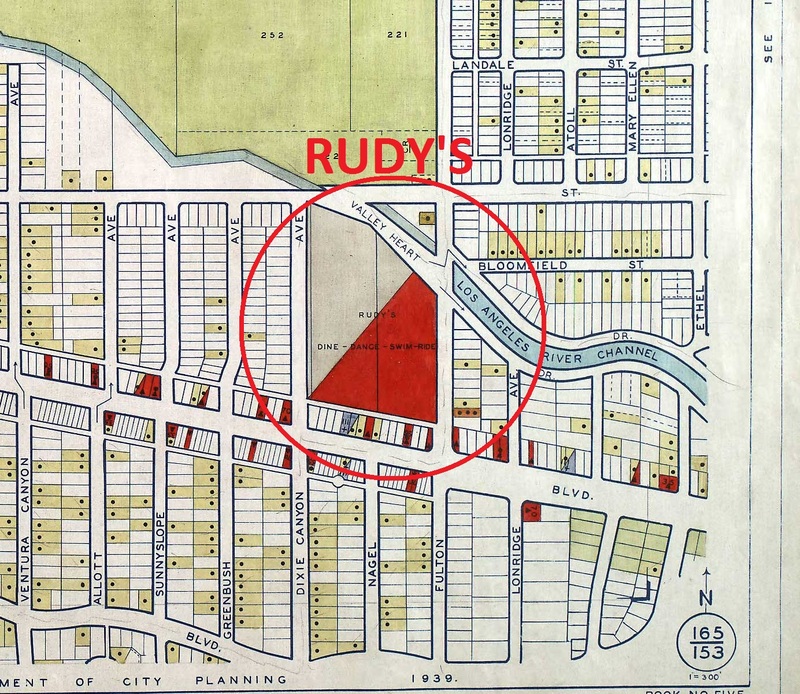 Rudy’s was characterized as a rowdy place by the Works Project Administration (WPA) in 1939. The combination of equines, beer, and dancing caused riots. One can only imagine no-good girls (hussies) with pompadour hairstyles and hoodlums carousing the area in teen buckets. Another Los Angeles authority, Martin Turnbull, posted a question about promotional materials he obtained for this location. In my extensive reviews of maps and information about this particular part of town I recalled seeing a WPA map describing this joint. Due to the manner in which WPA maps are organized it took me several hours to find this particular WPA map. Martin Turnbull had several questions about the materials he located. First, I was able to answer his question about the unusual telephone exchange, “VN” which to non-historians and persons born before 1960 are the numbers 8 and 6 on a telephone. VN was a Bunker Hill Exchange. Because the business card was made by late 1930s or very early 1940s club promoters the telephone number did not match the location for their event. It was probably a telephone number to their Bunker Hill rooming house. The other odd thing about the materials Mr. Turnbull acquired was it listed the address at one point as 1333 ½ Ventura. This was just a typo by the promoters who obtained a month’s access to the pool for $250.00. At the time there was a retail located at 13333 Ventura Boulevard. I am not sure why that address was listed for the extensive property in back of the alley that comprised Rudy’s Dine, Dance, Swim, and Ride. Maybe the dining occurred in that location. Rest assured, if there are any historic questions about Sherman Oaks and the surrounding area I will gladly answer them, and do whatever research I can. So do you think Rudy’s and the “Moon Over Miami Club” were incarnations of the same location? I am continuing to research this property. The property started with Holly Heights Polo and Hunt Club at an undetermined time. It was high-end until the Mid-20s. The Hollywood Hills Country Club (1923) was much larger and took the clientele. It was set up to sell the area in the Studio City Foothills and property South of Mulholland and as far as Dixie Canyon. I live on the former 9th hole. Due to the obscurity of the Hollywood Hills Country Club and my personal involvement with it I have always known I have to write an exhaustive article about it and make it one of my best, but have delayed for those reasons. Holly Heights became Rudy’s and Moon Over Miami and probably many other incarnations until the land was sold for the church and public school. Wait a second it’s the St Francis Church and School part of this parcel. When was that built?